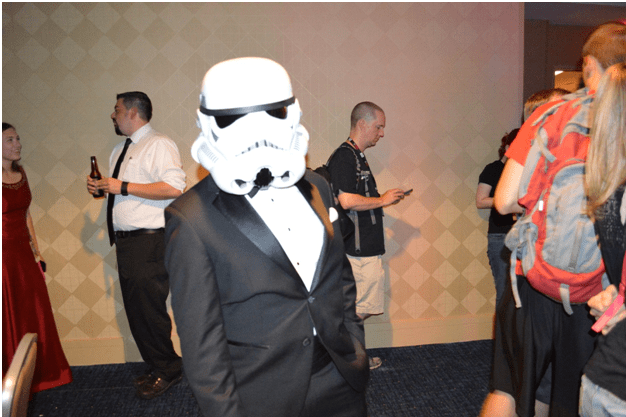 Star Wars Report went to Dragon Con and they brought us pictures! Greetings Making Star Wars readers! My name is Bethany Blanton, one of the Star Wars Report staff. 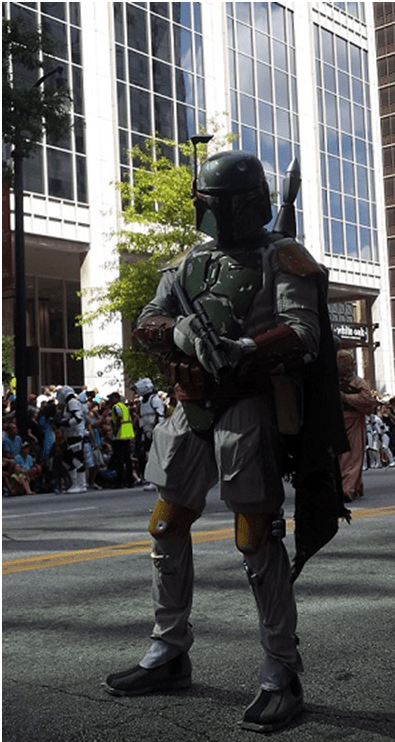 I recently attended Dragon Con, which has always been one of my favorite Conventions to attend, even though it’s not specific to Star Wars. 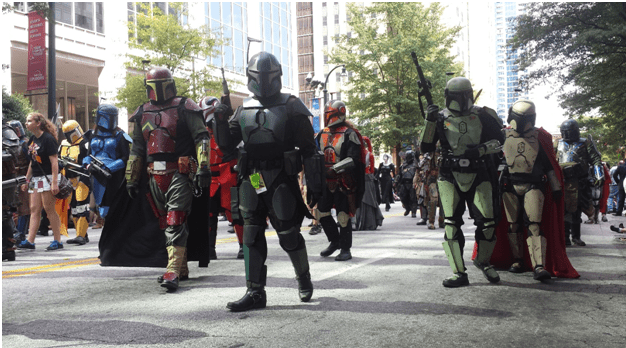 Dragon Con is the biggest geek convention in the Southeast, featuring many fandoms represented by costumes, celebrities, and fan tracks, which contain programming for each specific franchise and sub-genre. 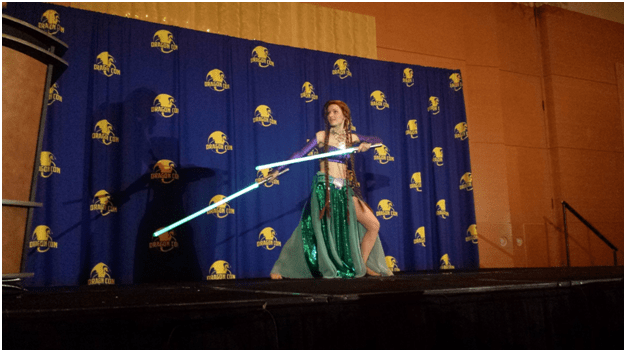 Dragon Con also has many forms of entertainment, dealers’ halls, panels, media personalities, parties, performances, and more! 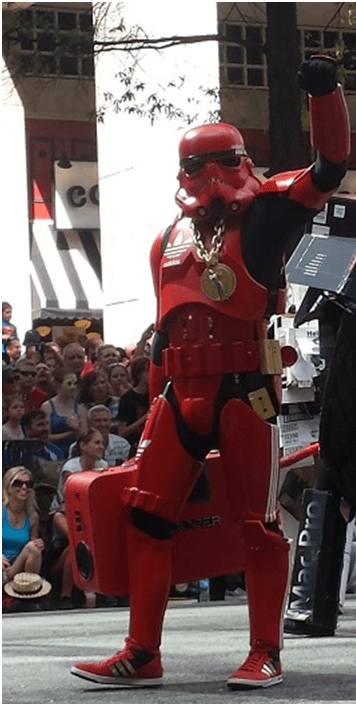 The Star Wars fan track is run by Brandy Roatsey and a team of other Star Wars fans. This year it featured Star Wars authors, actor Sam Witwer, and other media guests and fans. 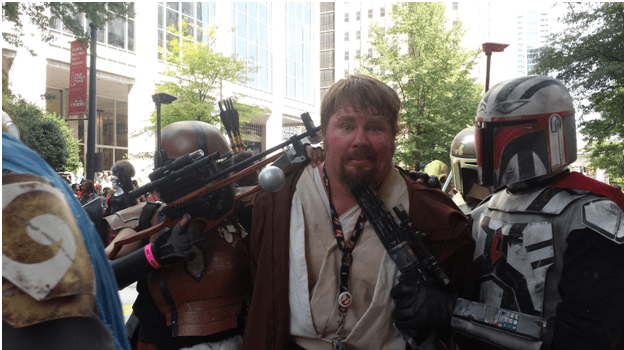 Your awesome Making Star Wars staff are giving me a chance to share some of my experiences at Dragon Con here, but for more of the Star Wars Report’s coverage, be sure to check out our dedicated coverage page here. 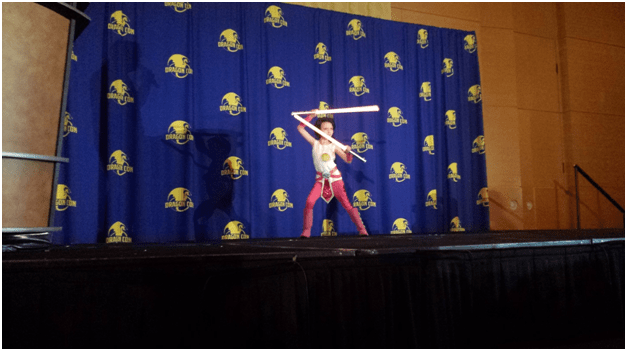 The following are my top twenty Star Wars costumes that I spotted during the course of the convention. 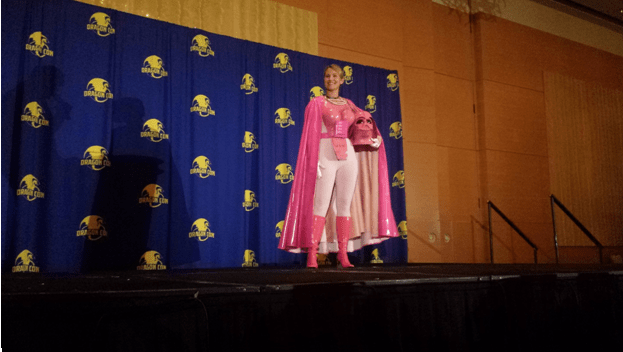 #20 Pink Vader: She was awesome, and very pink! #19 Classy Stormtrooper not only looked classy, he acted the part too. 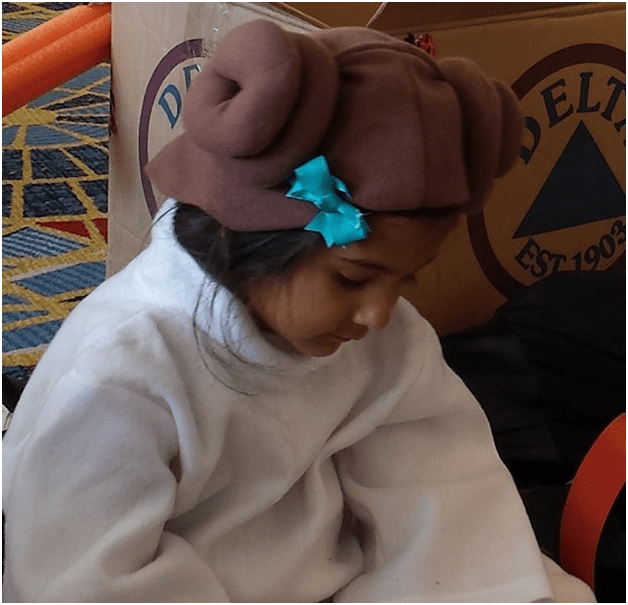 #18 Tiny Princess Leia: I couldn’t possibly leave this vision of cuteness out of this list. #17 Beer can and cardboard ensemble: These guys were friendly, fun, and their creativity reflected that! #16 Princess Ariel/Ahsoka mash up: This girl struck perfect Ahsoka poses, and her leggings even had the Ahsoka triangle patterns running down the side of them. #15 Captured Jedi and Mandalorians ensemble: These guys acted the part perfectly! Plus, their costumes had an impressive number of details. 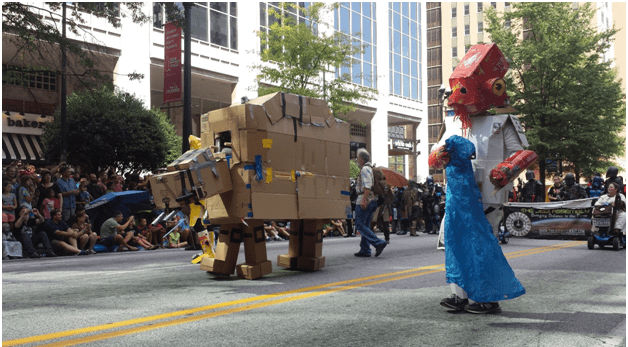 #14 Cardboard Admiral Ackbar and AT-AT were hilarious, and very creative! The level of creativity displayed by so many cosplayers at Dragon Con is one of my favorite things about the costumes there. #13 Jedi Ariel was the perfect combination of princess and Jedi, and her outfit’s details up close were incredible, especially the necklace she was wearing. #12 Lady Darth Revan: I loved the leather details on this costume, and was a huge fan of the light side twist to it. 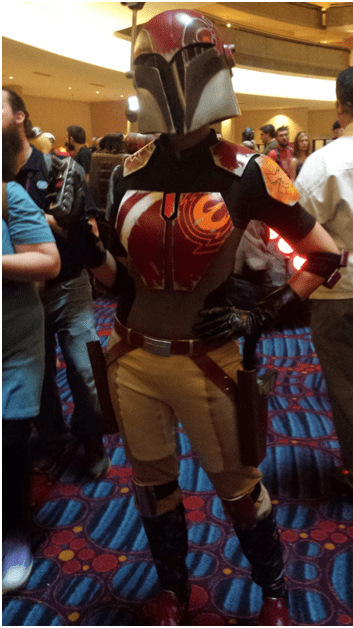 #11 Sabine from Star Wars Rebels: This cosplayer had the perfect attitude to go with the costume, and I liked how much she looked like the character in armor too. 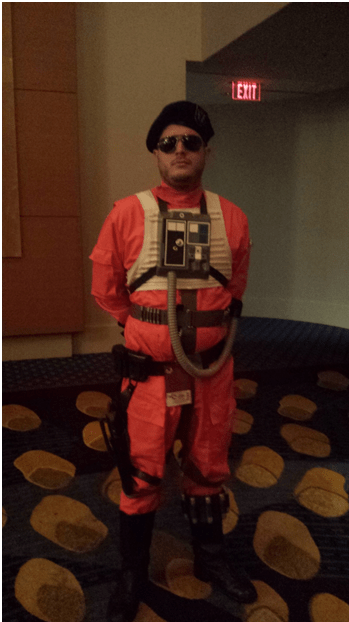 #10 Security guard X-Wing pilot: This was the “security guard” for the Star Wars Costume Contest, and his exaggerated security precautions cracked me up. #9 Starkiller: This Starkiller was really well done, even though the photo is a bit blurry. The worn and weathered details, and the material all suited the Apprentice’s look from the game. #8 The Mandalorians ensemble was frankly amazing. I can’t imagine how much effort each cosplayer went to in order to perfect their armor, and they were rather intimidating as a group. #7 Adidas Stormtrooper known as HipHopTrooper: This stormtrooper’s armor details were really good, down to the sneakers. He was also rocking out to his boom box during the parade. #6 Boba Fett: What can I say? He’s Boba Fett. 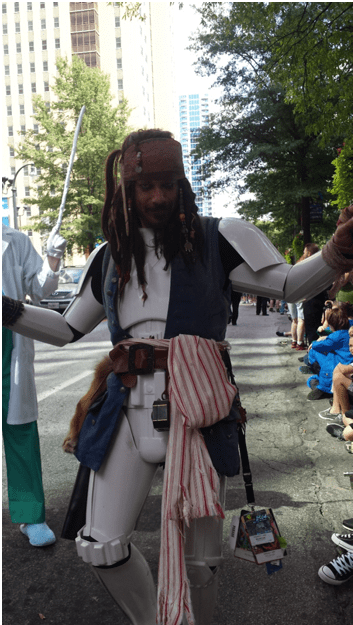 #5 Jack Sparrow Stormtrooper: This was one of my favorite costumes because of the creative mashup of two franchises I really enjoy. Also, the cosplayer had the Captain Jack drunken walk down perfectly. 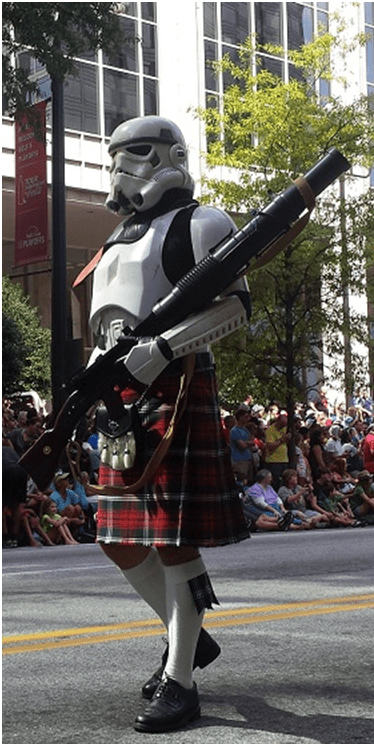 #4 Kilted Stormtrooper: What can I say, I have a thing for kilts. 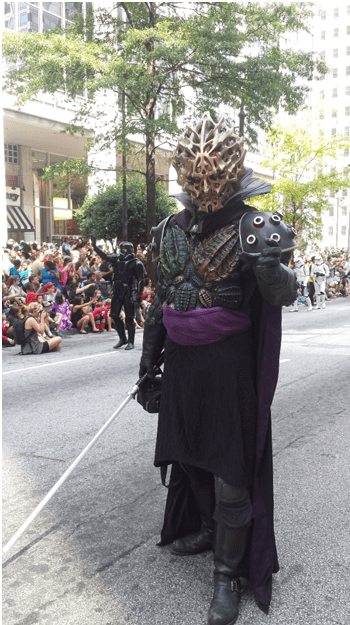 #3 Darth Bane: This costume was simply incredible. The detail of the exoskeleton was incredible, and I felt I’d been transported into a Legends novel. 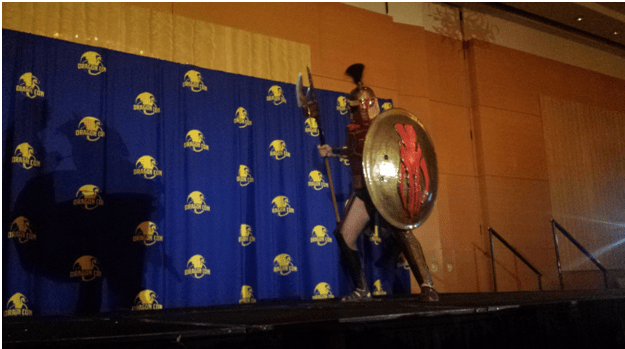 #2 Leonidas Fett: I like both Spartacus and Star Wars, so this costume was really fun for me to see. Plus, him yelling “This! Is! Mandalore!” at the top of his lungs during the costume contest made me see how perfect combining Mandalorians with Spartans really is. 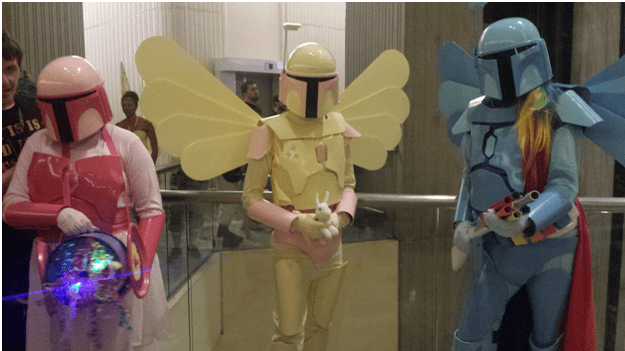 #1 My Little Pony Mandalorians: Yes, Pony Mandos. I have few words, just that these cosplayers really do represent Dragon Con well. Creative, wacky, impressive, and incredibly clever and original, I wish I knew who these guys were!